Let me start this race report by saying that I hate marathons. Running on road for 42km without the ability to just pee wherever I want like I can on trail…? Sounds like torture. But the Palestine Marathon was different. Running this marathon had a purpose and I wanted to be a part of it. The Palestine Marathon is organized by non-profit organization, Right to Movement (RTM), to promote the basic human right to freedom of movement as stipulated under Article 13 in the Universal Declaration of Human Rights. The RTM is a global community of runners who “run to tell a different story”. The marathon takes places in Bethlehem starting and ending at the Church of the Nativity. 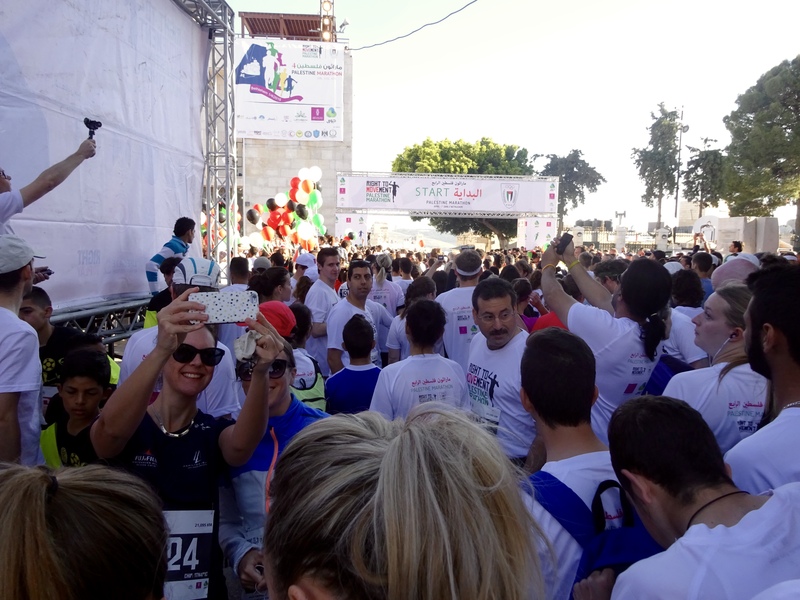 Due to the presence of the 8-meter concrete Israeli separation wall, checkpoints and road blocks, it is impossible for the organizers to find 42 km for a full course, so runners are forced to do two 21km loops. The race passes through two refugee camps and along the graffiti-covered wall, highlighting some of the realities of what it is like to live in Palestine under such restrictions. Even just getting to the race requires navigating through Israeli-controlled checkpoints, something which is not easy for many Palestinians. Runners from Gaza have the toughest time as they require permits to get out of Gaza, which are only given for very limited categories of individuals (like medical patients). This year, over 100 Gazan runners were unable to make it to the race because of lack of permits (actually, I’m not sure if any Gazans were able to join and run at all). 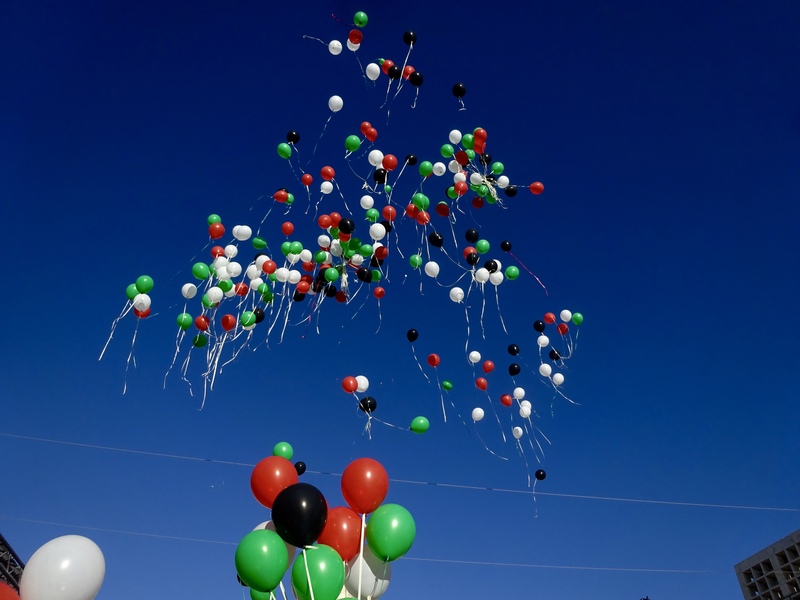 Just before the start of the race, bunches of balloons in the colours of the Palestinian flag were released into the air. Everyone was smiling and excited to be together to run, just because they could. Usually on a race start you can feel collective jitters from the runners, but on marathon day in Bethlehem, the air was steeped only in hope and excitement. I ran the race with my dear friend Belinda, and we decided to just have fun and enjoy the environment. We chatted away as we weaved amongst the runners, hi-fived little kids and waved back to the spectators, who yelled out ‘ahlan wa sahlan!‘ (welcome!) as we passed. Runners started dropping like flies early on – one poor guy was on the ground sweating after just 4km. I think more than a few runners headed out a bit too fast, too soon, and their lack of training was more than obvious… but I have to say, I have a ton of respect for that kind of spirit. Run fast, crash hard – why not? The race was about freedom of movement, not athletic excellence, and the runners were pushing their limits in every way. It was actually hard to pull back and maintain a reasonable pace with everyone sprinting around us. The aid stations were filled with water, gatorade, orange slices and super sweet Jericho dates. Volunteers were practically tripping over themselves to put glasses of water in our hands. You got to see practically everyone in this race because the loop course actually consists of a number of out-and-backs. You were constantly passing by other runners, which normally is annoying, but in this case was quite fun. Everyone was cheering each other on. Whenever we passed a runner who was struggling, I yelled out ‘yalla yalla!‘ and we would run together for a brief period, exchanging stories of where we were from and why we were running. Belinda and I got through the first half relatively easily. We definitely took our time, making liberal use out of the porta-potties and taking photos along the way. I think we could have spent hours reading the graffiti along the separation wall. There were messages and drawings of peace and protest, including artwork by Banksy. It was quite surreal actually. Runners were sweating freedom alongside one of the most imposing symbols of oppression. If you’re trying to hit your personal best (PB), the route is not ideal for a number of reasons. One, it is hilly (for a road race). Over 42km, you climb 470m (over 1500 feet). That is nothing in a trail race, but compared to major marathons like Berlin or Chicago, that is a lot. Second, the loop course is awkward. You literally have to run across the finish line for the half marathon and then turn around and start the whole thing over, bumping straight into half marathon finishers. Not that many people are running the full marathon, so some of the aid stations are taken down and the roads are open to cars. You feel like you are one of the last people still hanging around after a really good party has closed down. Third, you will run into constant obstacles ranging from a herd of sheep to small children eager to introduce themselves and shake your hand….But hitting a PB is not the point of this race. All of those things that will slow you down are what make this race so unique. At one stage, a group of five children blocked my way with their hands stretched out. I was confused until they threw flower petals all over me – it was their way of celebrating and appreciating the runners. And I loved it. I’ve written before about how easy it is to ‘hit the wall‘ when you train in Israel/Palestine. But in the Palestine marathon, the spirit of the runners seemed to defy it. I can’t wait to go back and run this race again when there is space for a full, uninterrupted 42km course. Inshallah. Please visit and like my new facebook page , where I will be sharing my running updates from now on! And check out my Strava run for this race! Thanks for following! I have always respected, admired and liked you, but now I must say I also adore you.